Waikiki is probably the most popular neighbourhood in Honolulu - the capital of the unique Hawaiian Islands. Known worldwide for its perfect beaches, Waikiki is one of the top destinations for holidays, when we talk about tropical exoticism. Waikiki is located in the south of Honolulu and is considered the most expensive and luxurious part of town. Prices of the apartments in this part of Oahu reach 1600 dollars per month for a one-room apartment. Waikiki’s name literally means "fresh water" and is associated with multiple springs and river arms all over Waikiki, separating it from the mainland. Today, Waikiki and Oahu are the only part of the Hawaiian Islands, where there is a network of public transport, known as the "bus". On other islands - Kauai, Maui, Lanai, Molokai and Hawaii is no such "extras". Most of the city's interior is composed of all kinds of hotels, restaurants, bars and restaurants with a variety of entertainment. The popularity of Waikiki as a tourist destination comes with building the first hotel Moana Surfrider on its shore in 1901. Since then Waikiki managed to become the most preferred tourist and first class section of Honolulu, as housing prices have increased every year. Waikiki is the only place that can boast a royal palace. The reason for this is that back in 1800 the royal leaders of Hawaii loved surfing in this coast. Today Waikiki Beach is one of the best for practicing surf. Even the legendary Hawaiian surfer Duke Kahanamoku, named the father of modern surfing, built his masterful performance in this sport, exercising in the waves of Waikiki beach. Because of his enormous achievements, on the beach is erected his statue, which is celebrated as an emblem of Honolulu. Today many tourists in this exclusive resort are able to hire a private tutor in surfing. Against the backdrop of a giant volcanic crater Diamond Head, surfing on the beaches of Waikiki is an incomparable experience. Practically, there is no water activity, which can not be practiced on Waikiki Beach - besides swimming and surfing, there are excellent conditions for body boarding, diving, windsurfing, paragliding, canoeing, catamaran sailing and even fishing. On the street across the street after the beach is where you can find the best places for shopping, dining, entertainment and all activities. The walk follows the entire length of two miles of the most popular beach in Hawaii. Here in eastern Gaza, next to Diamond Head is Kapiolani Park, where you can make a picnic or just relax on the grass with a book in hand. During the summer, during weekends are held mini film festivals right on Waikiki beach, near the park. Waikiki has to offer more pleasant sights not to be missed. You can not miss the Honolulu Zoo, and the world famous Waikiki Aquarium. This realm of the aquatic life is an obligatory stop for every tourist in Waikiki. Existing since 1904, it is managed by the University of Waikiki. The aquarium is located next to Kapiolani Park, on the coastal strip, close to the living coral reef. Waikiki Aquarium is the third oldest in the U.S. and offers a huge variety of 500 species of marine life and 3000 naval exhibits. 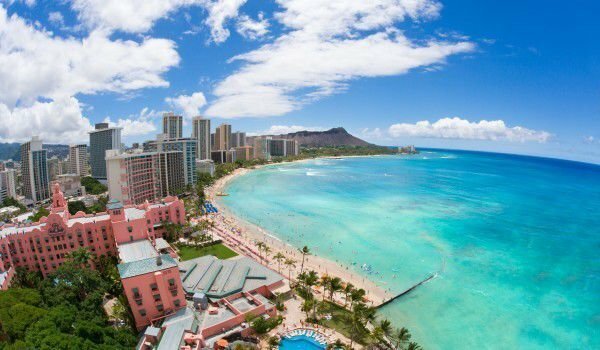 If you want to explore better shops or just have fun with your whole family stroll in Kuhio Avenues and visit the Royal Hawaiian Center and Waikiki Beach Walk. Only about half an hour from Waikiki are interesting sights like Pearl Harbor, Iolani Palace, beautiful scenery, botanical gardens and historical monuments Nuuanu Pali Lookout, and Hanauma Bay.